Even in a profoundly deafened cochlea, there is intricate network of living and active neural structures. If a cochlear implant electrode array deviates from the scala tympani to the scala vestibuli, a toxic inflammation can damage underlying auditory nerve structures. As Professor Helge Rask-Andersen explained, this is why structure preservation surgery should be considered essential for every cochlear implant candidate, even if there is no residual hearing—a deaf cochlea is not a dead cochlea. In fact, damage to the structures of the cochlea can result in significantly lower speech understanding and loss of residual hearing—clearly not an ideal outcome for any cochlear implant recipient. First, let’s look at the basic design differences between pre-curved perimodiolar arrays and flexible lateral wall arrays. Pre-curved perimodiolar electrode arrays are designed to wrap around the modiolus of the cochlea. Flexible lateral wall electrode arrays are designed to freely conform to the curve of each cochlea. All MED-EL arrays are flexible lateral wall arrays—and only MED-EL offers truly flexible lateral wall arrays. 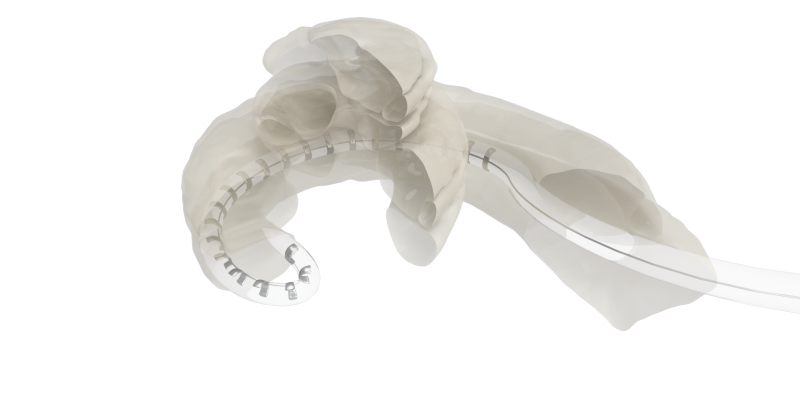 MED-EL cochlear implants have always used highly flexible lateral wall arrays. These arrays provide superior atraumaticity and minimal insertion force through wave-shaped wires, optimal contact spacing, and ultra-soft FLEX-Tip technology. These key design features are what set MED-EL flexible lateral wall arrays apart from pre-curved perimodiolar arrays and other lateral wall arrays. In fact, MED-EL arrays are the only electrode arrays to feature wave-shaped wires distributed evenly throughout the electrode array. This makes our arrays incredibly flexible in every direction. This superior flexibility is only possible because every one of our arrays is handcrafted by an expert technician. The wave-shaped wires in MED-EL arrays provide exceptional flexibility in all directions. The wires are distributed evenly throughout the electrode array. That’s why MED-EL arrays use a rounded tip that gently deflects to guide the array to the most suitable placement. 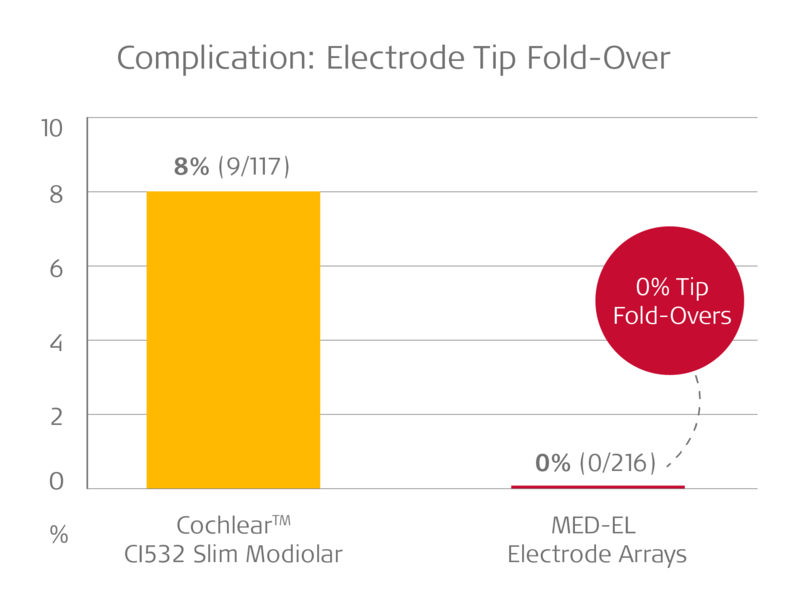 In contrast, pre-curved arrays such as the Cochlear™ Contour Advance® or Cochlear™ CI532 Slim Modiolar electrode use a pointed tip. Let’s look at why design makes all the difference during electrode array insertion. During any electrode insertion, the array must travel from the site of insertion to the final position. Ideally, the array would be inserted through the round window and remain fully in the scala tympani as it travels toward the apex of the cochlea. Flexible MED-EL electrode arrays can freely adapt to fit the unique shape of each individual cochlea. However, there’s another issue that can occur when the pre-curved perimodiolar array tip becomes lodged or meets resistance—often referred to as electrode array tip fold-over or tip rollover. Basically, in tip fold-over or tip rollover, the electrode array folds over upon itself. The array tip can bend back towards the insertion point or laterally through cochlear structures. Clearly, an electrode array folded over upon itself is not a desired outcome. Often, the folded electrode deviates out of the scala tympani, causing damage to the cochlea.5,6,7,8 For your patients, this can mean significantly lower speech performance. Of course, tip fold-over would also make an already short array even shorter—which could seriously limit the effective stimulation range of the array. A folded tip can result in less than half a turn of coverage in the cochlea. This would result in even worse place-pitch mismatch, which can have a serious impact on hearing performance. Atraumatic lateral wall arrays from MED-EL offer reliable scala tympani placement with practically no risk of tip fold-over. With MED-EL, your patients can benefit from better hearing performance and more natural sound quality. What are your thoughts on tip fold-over and electrode arrays? Send us a message or leave a comment below. And don’t forget to subscribe now to get more articles like this sent right to your inbox! Want to know more about MED-EL implants for your clinic? Contact your local MED-EL representative to get started. Dhanasingh, A. & Jolly, C. (2017) An overview of cochlear implant electrode array designs. Hear Res.356: 93–103. Data on file. Based on internal database dating back to 1996.